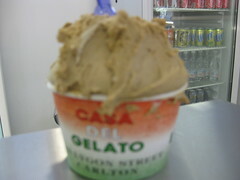 I was a very happy girl when I found soy based gelato on Lygon Street. I think I had coffee and hazelnut flavours. Nice to have them without then getting an upset stomach in return! It had a slight different feeling on my teeth, but it’s easy to get through that because of the flavour! 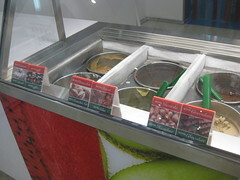 Casa Del Gelato 163 Lygon St, Carlton Victoria. OOooO this is great news! I love that place (i think it’s the same one i love) and my boy has just recently taken up a dairy free lifestyle for medical reasons, so I shall have to take him here!! apparently so good do a supermarket one, but I’ve only seen chocolate, which I’m not game to try, there might be vanilla.